This document will evolve. Not all the parameters are documented right now, but following a request from kfilar, I have posted my first draft. I would suggest that you only look at it if you really need to. It is better to wait for the final version! Great Jim... this wil come very handy. ..."one day we will become Masters!.." Thanks very much for posting this. I've read it through and learned just how complicated rendering engines are. I think I'll end up being one of a class of users that want more control over their renderings than simply a push of the button, but hope we don't have to understand rendering engine variables such as "FGangTol - final gathering angle tolerance. This determines sampling on curved surfaces and the angle change before new samples are added, default 30" in order to get the rendering look we want. My impression is that a majority of the variables fall into the latter category right now. Consequently, my first impression is that it might make a lot of sense to pull a few variables out of the presets and into the main dialog boxes: variables that users could tend to want to adjust a lot (sky exposure, sun exposure, turbidity, and something simple that adjusts the "high dynamic range" contrast). Anything that wants to be adjusted based on time of day is important because we'll want dusk shots and day shots and night shots of our buildings. Dusk shots are really key because they can be the most flattering to buildings. You'll notice how many professional photographs of buildings are taken during the "magic hour" around dusk. Also, I would be careful about relying on the SU sun/shadow settings to adjust certain Podium variables. If we need those to tweek Podium correctly, then we might end up with 2 sets of saved scenes: one that works for the bitmap exports we will still want from SU (and to show clients "live" views), and one with different sun settings appropriate for Podium. I like saving sun settings for SU scenes because there are typically certain times of day that work best for particular views toward a building. 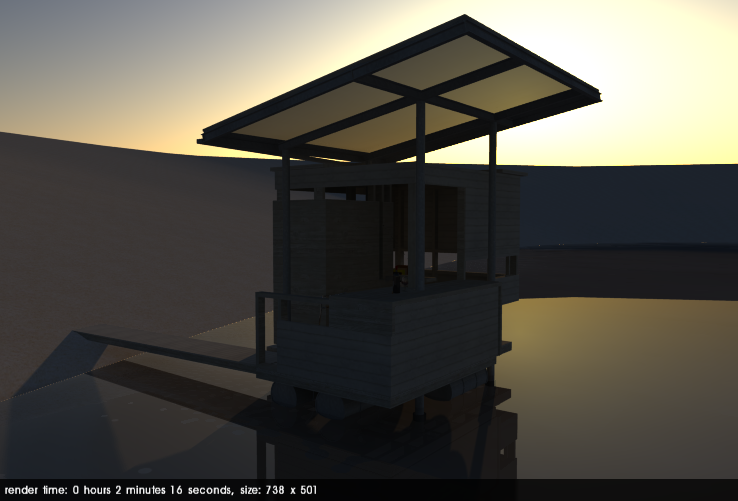 A time of day that works on one side of the building will put another view of the building completely in shade/shadow. I don't know what's the optimum solution, but I guess I first wanted to see if you thought the idea had merit. This illustrates the point quite well. Once you understand that FGangtol (Final Gathering angle tolerance) controls the density of smaples on curved surfaces, if you have splotches on curved surfaces, you know that you might wan't to reduce the distance between samples. Alternatively, if you want more speed, you might want to increase the distance. Most users don't change most of the variables most of the time, which is where the whole principle of presets comes in. However - the variables that are modified vary a lot from scene to scene, so it's not straightforward to expose just a few. For things like tonemapping, we are planning to expose these settings, and possibly turbidity and exposure. We did have a build that had sliders for these, but it was really tricky to get right and needed precise numeric control. It also needed to take the default values from the preset, otherwise, the whole notion of a 'one click' approach doesn't work, because exposure is a critical value that varies hugely from interiors to exteriors. There simply isn't a universal default value that works. So - although we could include numeric control over these variables, unless we drive the defaults based on the preset chosen and use this as an override, it conflicts totally with the whole approach of Podium and would annoy 90%of users. Linking the presets to the dialog values requires a different approach to how the presets are implemented which is quite a significant code change. I have attached quite a nice dawn render. The model is courtesy of zem. Any chance of docs for the pixel filters? I like the look of the filters that I've seen so far (chromatic aberration, etc). I'm wondering what else is in the engine. You are getting confused with pixel filters which (in Podium/Kray scripting terms at least) control edge sharpness or softness, and post processing filters. Pixel filters have option for lanczos, box and mitchell-netravali. The lanczos filter gives a sharper appearance, whereas the mitchell filter is much softer and nicer for higher resolution photos and should be good for photomontages. Some are better for moire patterns. There is more information on this here. Our engine doesn't support all of these, but also includes some that Vray doesn't have. If you want more information, I'll have to get you a list. Hi, is it possible to configure different presets using RenderAll - you see I have a house which has both exteriors and interiors to render, but when we render, it uses the preselected preset to render all types - ends up making the interiors really dark. It would be good to have a default preset (as assigned by the configuration setup dialogue box), and then alternative preset for each scene if required. ie. the majority of the scenes are exterior shots, with just one or two interior shots - I would assign an exterior preset first, and then when I goto the the renderall dialogue box I can assign alternative presets to the interior scenes. Unfortunately, no. We removed it from the latest build because it broke stuff. We have more to do on this feature. ok thanks for the reply... hopefully one day it's possible. Right now, I can only render a portion of the scenes wait a few hours, hopefully come back to the computer to begin the process again. Gives more reason to have longer coffee breaks! It's actually a really good suggestion, that would probably be better in the Wishlist section. Can the PDF come in a printable format? All you need to do is scale the contents to fit your page size. sorry, but the first version of the PDF I downloaded was not a printable version on my mAC. it was locked. a friend unlocked it and I'm jamming now. thanks!